Have you considered mountain biking, but living in the busiest city in the world doesn’t leave you with enough time to get into trail-shredding? Don’t worry, we’ve got you covered. 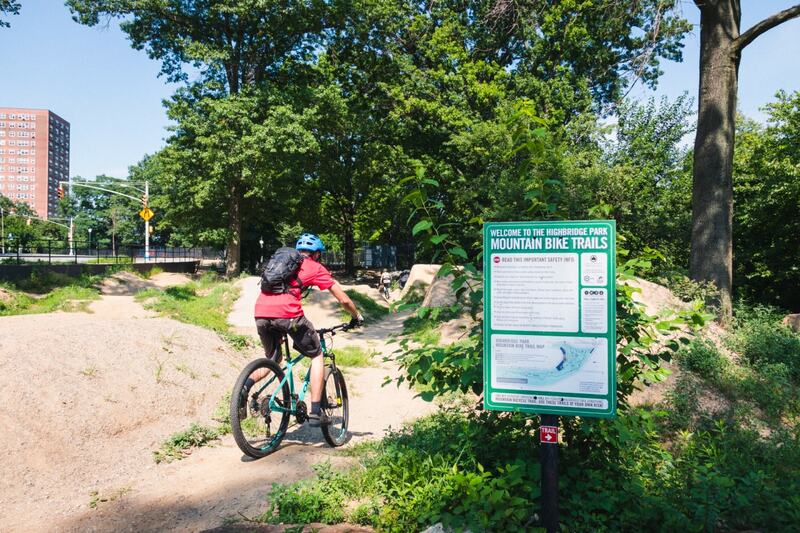 Surprisingly, New York City features excellent parks to give you a proper start in mountain biking, as well as more challenging trails for experienced MTB enthusiasts looking to set a higher bar. Here are a few mountain bike trails you should definitely check out, in no particular order. 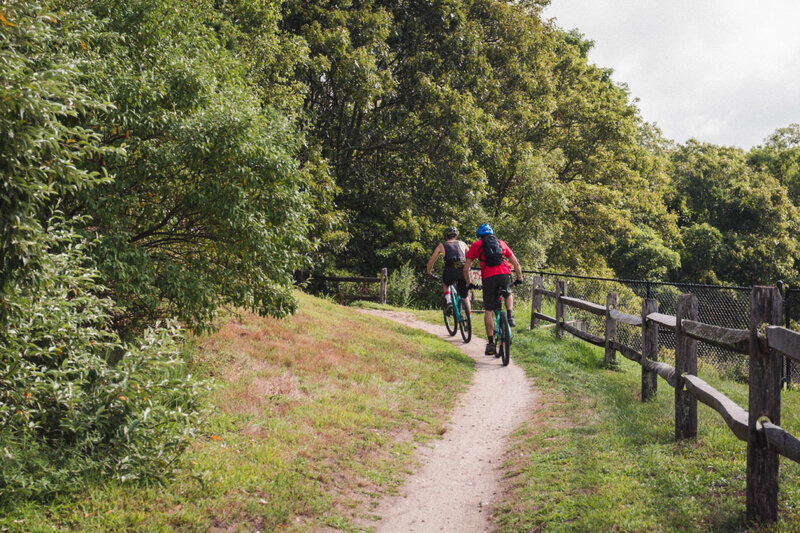 Cunningham Park lies in Oakland Gardens, a quiet Queens neighborhood, and it’s a perfect place to start your mountain bike adventures. The park is mostly flat, but full of fun singletracks, combined with jumps and a pump track. A small concrete bridge connects the two parts of the large park and is a perfect place to improve your manual and wheelie skills. Since the trail is so flat, it is difficult to ride at full pace all the way, but on the other hand, you won’t get tired after steep climbs because there are few. The trail is mainly dirt, with a few tree roots on the way, but watch out because there are some bigger ones that can be harder to get around. In the middle of the park there are a few flat jump sections, which is the final beginner goal after perfecting the bunnyhop, wheelie, manual, and a few fast turns around the pump-track. 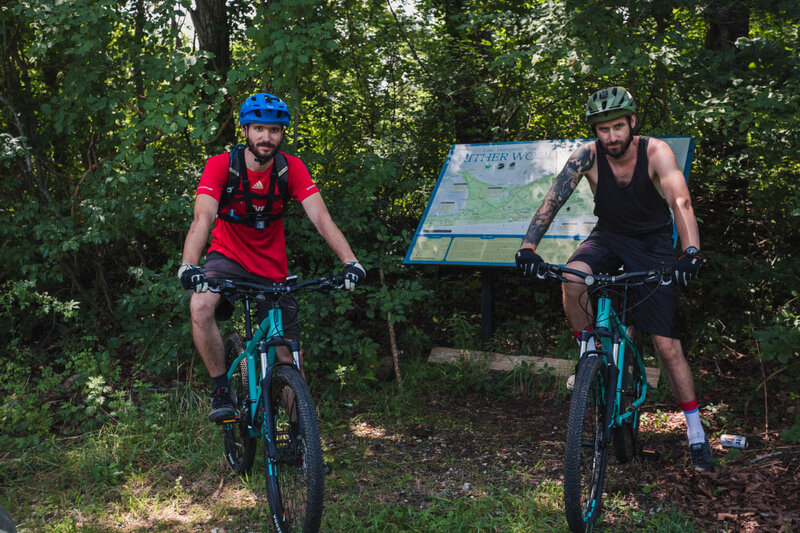 This course can be fun – although less intimidating – for experienced riders, and it’s really close to the city, so give it a try if you haven’t already. For more in-depth analysis of Cunningham Park, including 3D terrain visualization, track video, and bike metrics. Check it out! Graham Hills is a whole lot of fun. It offers a wide variety of trails, ranging from intermediate to expert. The only downside is a majority of track sends you a few dozen feet up, and then immediately down. It’s definitely not flat, and you’ll climb pretty hard on some sections. It would have been nice to climb for half an hour, for a more gradual ride down, but it was a great challenge. The more advanced sections are especially fun, but watch out for bigger rocks. If your bottom-bracket is lower, sometimes the only way to get by is to get of the bike. For more in-depth analysis of Graham Hills, including 3D terrain visualization, track video, and bike metrics. Check it out! 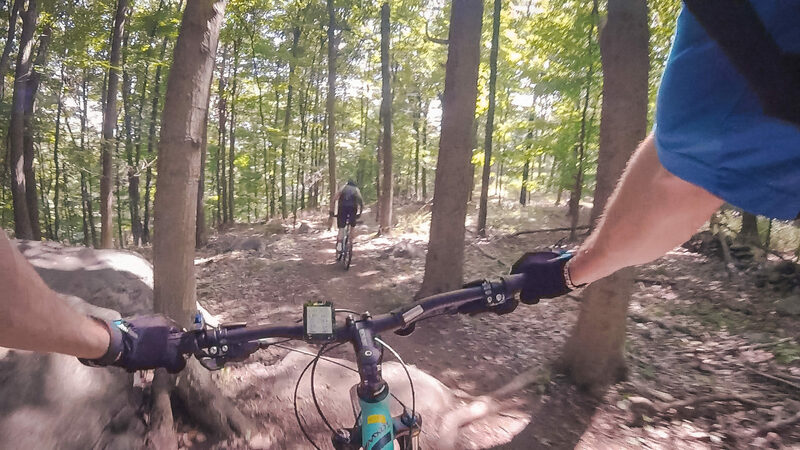 If you live farther out on Long Island, Glacier Ridge should be your top MTB destination. Easy to access with a big parking lot, this is a great spot for all mountain bikers. Like most of the trails near the city, it’s consistently flat, but if you go for a more aggressive ride you’ll quickly find yourself out of breath. On the weekends, there are a lot of riders, but these fellow singletrackers will yield if you’re chasing that personal record on a Strava segment. Our crew managed to rip the blue trail in around 15 minutes. There is also a trail for absolute beginners, and a more technical one for demanding riders. For more in-depth analysis of Glacier Ridge, including 3D terrain visualization, track video, and bike metrics. Check it out! If you’re willing to take the hour long car ride from Glacier Ridge, Hither Woods is definitely worth exploring. This bike trail will take you on a ride that ends on the beach – which really comes in handy after a sweaty trail shredding! Located in Montauk, it’s a perfect place for day trips, combining chill sunbathing, swimming, and of course, mountain biking. There are multiple towns nearby worth exploring, especially on the weekend. There are fairs and different local festivals, and great places to eat lobster rolls. If you’re a fan of the Showtime series The Affair, you’ll know what we’re talking about. But what about the riding? It may seem boring, especially in the middle portions, but that’s just the calm before the storm. The section by the ocean is where this trail shines the most. When you get there, all the “boring” parts will be worth it. After a marvelous view, it takes you descend through a fun section which leads directly to the beach. For more in-depth analysis of Hither Woods, including 3D terrain visualization, track video, and bike metrics. Check it out! Highbridge is the closest of all parks we tested, located in upper Manhattan’s Inwood. Sadly, it didn’t meet our high expectations. The trail is short, which isn’t a bad thing if the trail’s a load of fun, but Highbridge didn’t provide the basics. The hilltop entrance to the park is streetside, and a parking space was easy to find. There you’ll find a pump track and a dirt jumping section. The trail starts at a steady pace (you can even do one short and easy loop like we did), and as it gets fun, the trail ends. On top of that, a majority of the technical part of the track looks abandoned, and isn’t easily rideable. In what is otherwise a great park, the trails are littered with broken glass, leaving it unsafe to ride. If we were to test only dirt jumping, this would be a great place to MTB in NYC, but otherwise, give this place a go only if Cunningham Park is too far. For more in-depth analysis of Highbridge Park, including 3D terrain visualization, track video, and bike metrics. Check it out! It’s tough to put one park above another – they are honestly all great. Instead, our ratings will give you a good overview of where to start based on your skills and location relative to the city. Depending on your riding style, you’ll definitely find something to suit your needs. At the end of the day, the most important thing is just to get out and ride!